I can’t stop thinking about this little indie sports RPG – and it deserves the attention. We’re starting to get into the big end-of-year release season, and that means that I’ve got some pretty big games on my plate, plus preview phase stuff for top games coming early next year. It’s starting to get busy, and yet… Golf Story. Golf Story! This little Switch indie game has its claws in me, everything else be damned. This comparison is being made everywhere, but it rings so true I simply must make it as well. In 2001 I got a copy of Mario Tennis for Game Boy Color. It was an intriguing little game not because of the Mario influence on the core tennis gameplay but because of its ‘Mario Tour’ mode, a mash-up of Tennis and RPG where tennis matches filled the same role that battles would in a traditional RPG, with your downtime between matches spent progressing a plot, increasing your character abilities and tackling side quests. Later I’d learn that the Game Boy Color version of Mario Golf had the same sort of mode – I immediately picked that game up. Mario Golf and Tennis for GBC are bloody amazing, and this is why I picked up Golf Story: somebody told me it was like those games. Probably the greatest compliment I can give to Golf Story is to say that it reminds me of those games. If you’re looking for a cute sprite-based RPG, it’ll serve you well – and if you’re looking for a great-feeling 2D top-down golf game, it’s also excellent at that. Golf Story lays its groundwork confidently in the early hours: your unnamed protagonist has held desires to be a pro golfer from childhood, and now’s the time to make it happen. You return to your childhood course, now overgrown and poorly taken care of, and try to persuade a coach to take you on. The game unravels from there, with you left to free-roam a variety of courses searching for secrets or free to take on more structured and typical tournament-like rounds of golf. As you wander around you have two primary methods of interacting with the world: through golf and through talking. There are NPCs scattered everywhere, and many of them hide side quests and little side activities and challenges. How far can you drive the ball? How hard is it to nail a hole while only playing from and into the rough? Everything tends to yield a reward of both money and experience, and when you level up you can place ability points into a variety of categories to develop your golf skills in a specific direction or keep things well-rounded. It’s satisfying stuff. Eventually you get to a modest overworld of sorts that lets you ferry yourself from course to course. Your first course is a sort of run-down but typical golf course, but soon enough you’re visiting a course that appears to be in a prehistoric world with obstacles like dinosaur bones and thick, inescapable mud, or a golf course that’s set among a beach meaning you’re left in serious fear of sand and water hazards. It hits all the beats you’d expect: a spooky level, a snowy level, and so on. Your golf challenges adjust based on this. There’s variety in that, and further every zone has little unique things to do. The first area you’re in has hidden balloons to pop and switches to flick with well-placed shots, and doing so can open up new areas or offer up rewards. Perhaps the most satisfying touch is how you can drop a ball and tee up anywhere while in the free-roam mode, and yes, you can shoot the ball right at an annoying NPC if you’re so inclined, too. Each new location is packed with things to do, and once a zone is exhausted you can hit the links to play the actual course before moving on to the next area. Money can be used to upgrade your equipment and so on, and you can even loot little desk drawers and the like for extra money – the true sign of an RPG. 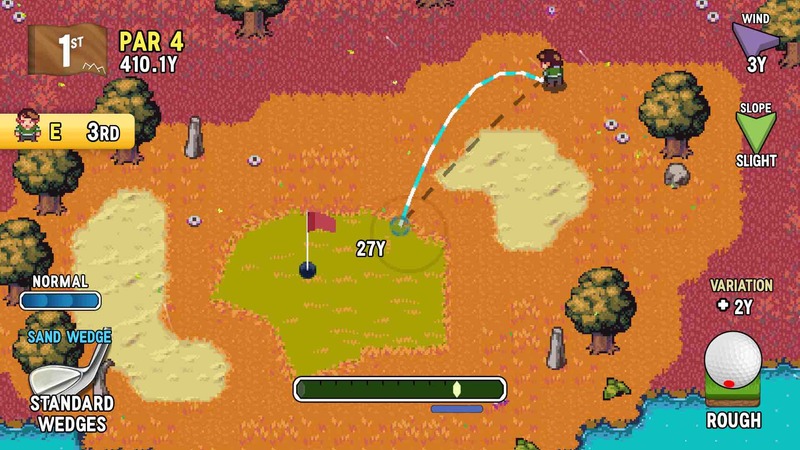 Golf Story creates a fun and satisfying world you’ll want to immerse yourself in. 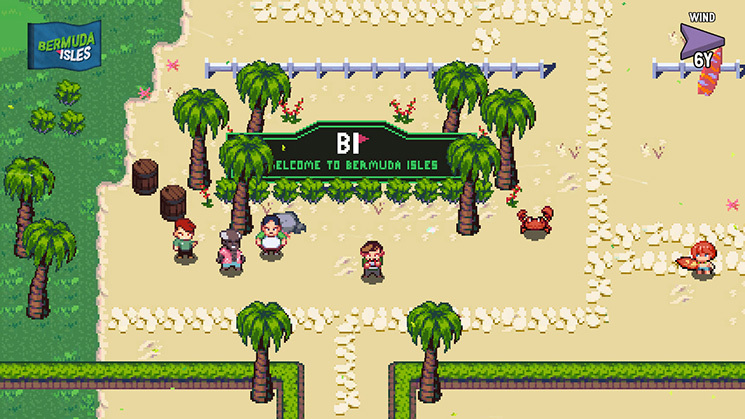 It’s charming and full of heart, with lovely sprite-based art and some gameplay turns that lead it to expand in some unexpected ways, adding some moves and abilities to your character beyond just golfing. There’s a lot to do, and for its entire running time it never felt like it was at risk of running out of steam even when it chose to toss out some uninspired fetch and trading quests. The heart of the game is still golf, of course, and that feels great. You have control of placement, spin, club choice, and even the ability to put a proper curve on shots. You’ll also have to worry about slopes and wind. It took me a little time to get used to the nuances of how the game works, especially on sloped greens which aren’t as obvious as in a 3D game, but once it clicks this becomes a great, competent, arcade-style golf sim in its own right. The RPG elements aren’t as deep as a proper RPG, but that’s fine: you really should be coming to Golf Story for the golf and staying for the rest of its charming repertoire. Golf Story knows it, too: outside of its story mode you can play local multiplayer with two Switch Joy-Cons and solo in a story-free quick-play mode. The golf action is pretty good, so that comes easily recommended. Speaking of joy-cons, this game has some of the most subtly brilliant use of the HD Rumble tech to date, too. Golf Story is by no means some barnstorming, perfect game-of-the-year contender, but for what it is, it’s a bloody marvel. This is a very reasonably priced, charming and fun downloadable game that really feels like a match made in heaven for the Switch – and it’s a remarkable first outing for developer Sidebar Games. Switch owners owe it to themselves to give this one a shot.